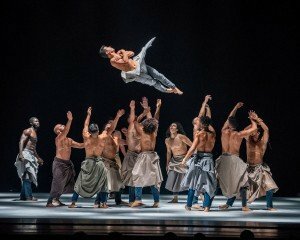 With the first two programs of both its 75th Anniversary Celebration and the 15th Anniversary of its Fall for Dance Festival, New York City Center presented its usual potpourri of different forms of dance before sold out houses of enthusiastic audiences. But this year, at least so far, the caliber of programming has exceeded expectations. Indeed, in my view there was only one disappointment – and that one improved as it progressed, so perhaps I’ll change my mind on subsequent views. As for the rest, every one of the pieces in Program 1 left a positive and indelible impression; and in Program 2, Gemma Bond’s new ballet, Inner Voices, though not without flaws, is quite good, Sleep Well Beast, Justin Peck’s pas de deux for himself and Patricia Delgado, is superb, and Paul Taylor’s Promethean Fire is an unqualified masterpiece. 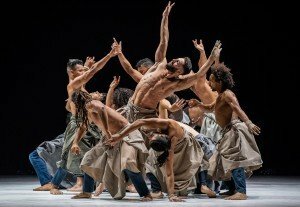 The best way, and the only way, to make sense out of this quality dance performance mélange is to discuss the programs, and the dances within them, seriatim – necessarily focusing on certain pieces and giving relatively short shrift to others. But sometimes one must dispense with logic, and having now seen Program 3 as well as Programs 1 and 2, I must begin with highlights from that program. More detail will follow in a subsequent review, but I couldn’t let my thoughts about the initial two dances in Program 3, both City Center commissions in their world premiere performances, ricochet silently between my ears until then. Simply put. 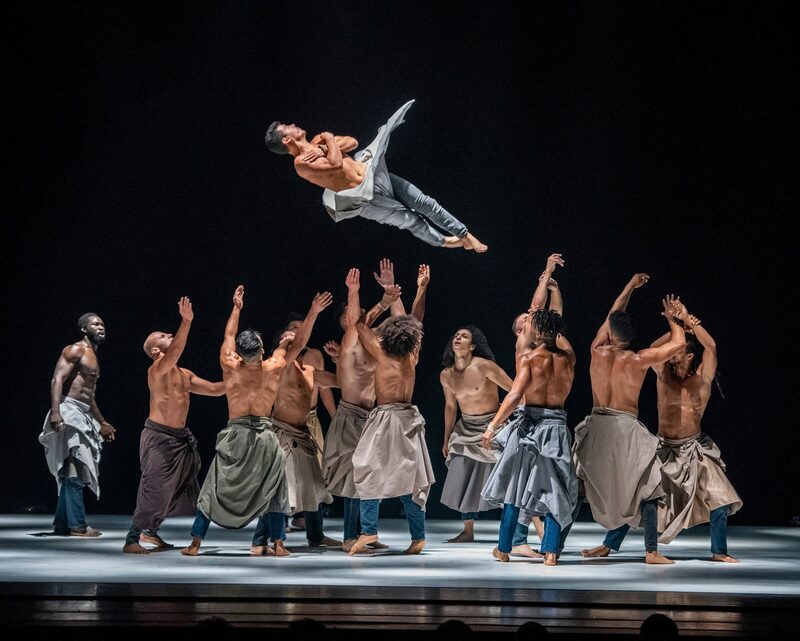 Annabelle Lopez Ochoa’s Balamouk is the finest new work, as choreographed and executed, that I’ve seen from Dance Theatre of Harlem in a very long time. It’s not a monumental ballet, nor is it “cutting edge,” but it doesn’t try to be. Rather, Balamouk, which to my understanding is Romanian for “house of the insane” and is the title of a multicultural album by Les Yeux Noirs (The Black Eyes), one of the dance’s three musical sources, is a sparkling, joyous ballet that melds its disparate musical cultural sounds – I heard Klezmer and Greek, among other folkish references – into a coherent whole, and that showcases the individual and group talents of the company’s ten participating dancers. It’s a fitting tribute to Arthur Mitchell, New York City Ballet Principal Dancer and DTH’s co-founder, who passed away a couple of weeks ago, to whom the program was dedicated. And the evening’s opening dance was a stunning surprise. I had not previously heard of Tayeh Dance or recalled that I’d previously seen one of Artistic Director and choreographer Sonya Tayeh’s dances (Face the Torrent, performed by Cuba’s Malpaso Dance Company at the Joyce Theater last January), nor had I heard of singer / songwriter / musician Heather Christian and the two vocal artists who accompanied her live on stage, but that demonstrates yet again that I need to get out more often. Perhaps in part because it was such a pleasant revelation, I found Reclamation Map (I haven’t a clue – yet – as to the title’s significance, but I suspect there is one) to be a mesmerizing, haunting, multi-textured piece of complexity and dramatic tension, generating in the process an atmosphere to get lost in. Like a novel by William Faulkner – you may not “get” it on a word-by-word, page by page, note-by-note, step-by-step basis, but you certainly “feel” it as the ambience these artists create opens the door to a strange but somehow not unfamiliar world. In its moments of passionate despair, parts of it vaguely bring to mind Christopher Wheeldon’s brilliant This Bitter Earth pas de deux, but Reclamation Map is more structurally diverse and cohesive than my recollection of Five Movements, Three Repeats, the full piece from which Wheeldon’s pas de deux was culled (and which coincidentally had its New York premiere at the 2012 FFD Festival). The trio of singers provided an awesome display of passion and harmony, and by focusing on one I don’t mean to ignore the musical contributions of the others. But to my admittedly unsophisticated musical ear, Christian, who wrote, played, and sang lead for the suite of songs which inspired and was reflected in Tayeh’s choreography and the performances by the four compelling company dancers, is a composer / chanteuse who presents an unusual, and potent, combination of delicacy and power, crystalline clarity coupled with earthy expressiveness, emotional depth, and most of all, soul. Even before the dance’s movement structure began to develop, her introductory sounds cast a spell from which escape was impossible. In her words (or sounds, when I couldn’t decipher the words due to my location in the house) I heard the intelligence and sadness of Jacques Brel (think “Amsterdam” more than “Ne Me Quitte Pas”), Adele’s sometimes bleak mystery and pain, and Edith Piaf’s despairing heart. Add a little LeAnn Rimes, a little Lady Antebellum and a lot of deep south gospel, and maybe you get a rough idea of the magic her music, her voice, and her delivery (she doesn’t just sit there) create. In case it’s not yet clear, the piece blew me away. 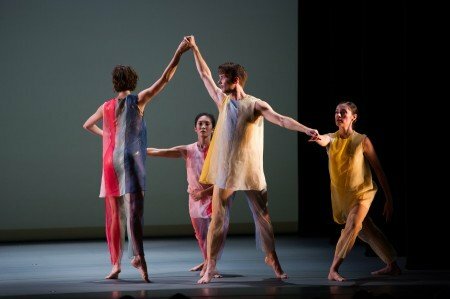 With Program 1, City Center presented a seeming tale of two forms of dance entertainment, and two types of dance audiences. That it all worked splendidly is a tribute to dance excellence of any form or era. On the surface, the difference between the first and second halves of the program is about control vs. abandon – for both the performances and the audience. Of course, at least with respect to the pieces danced, it’s more the appearance of abandon than any absence of control. Indeed, all four pieces in Program 1 exhibited remarkable control. The difference and the resulting audience response, was the sense of energy and abandon that the second two pieces demonstrated. All four dances in Program 1 were excellent examples of their art, both in choreography and execution. 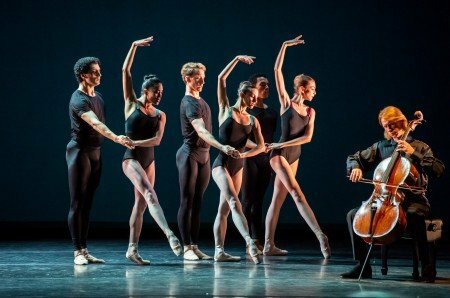 The first two, Jorma Elo’s Bach Cello Suites, performed by members of Boston Ballet, and Sara Mearns dancing in Lori Belilove’s (after Isadora Duncan) Dances of Isadora, a Solo Tribute, were models of inventive rigor. Elo’s piece is contemporary ballet that doesn’t push the envelope, but does what it does with invention and grace. Dances of Isadora accomplishes the same for Duncan’s form of modern (or pre-modern) dance. But both are as good as they are because of the control reflected in the choreography and the dancers’ execution. Duncan might have been appalled at the thought that her dances could be seen as indicative of “control” rather than the “spontaneous abandon” and “natural movement” for which she was famous, but times change – and when the dance is performed by Mearns, a Principal Dancer with New York City Ballet, a sense of consummate control goes with the territory. But within eyeshot of my position, many members of the audience began to fidget, as if waiting for something beyond technical brilliance to happen. The second two, Caleb Teicher & Company’s Bzzz (another City Center commission having its world premiere), which Teicher choreographed “with improvisation by dancers,” and The Barbarian Nights, or the First Dawns of the World (“Barbarian”) danced by Cie Hervé Koubi in an excerpted form, had the appearance of wild abandon, spontaneity, and irreverence – an absence of control – that the other two pieces did not. Through both pieces, the audience was noisy and ecstatic. Of course, the audience reaction was likely a product of people being attracted to programs that feature forms of entertainment that appeal to them, but that begs a set of questions for which there are no easy, or satisfying, answers. I’ve seen only a limited number of Elo dances, but Bach Cello Suites is the best of them. 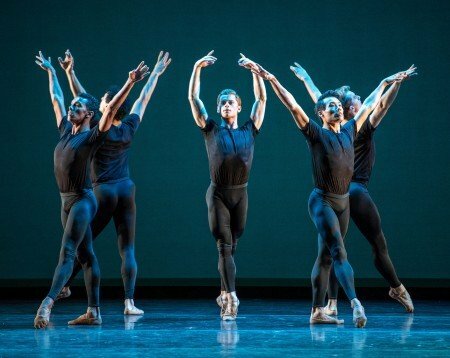 The program would lead one to believe that the ballet essentially consists of five couples dancing sequentially, but the piece is far more visually inventive than that. There’s nothing “cutting edge” here, but that’s not necessary. The element of pleasant surprise as the initial introduction of couples yields not to a duet by the first couple, but to an extended sequence involving the men alone, is the first hint that Bach Cello Suites is not your standard multi-couple ballet, and the visual variety continues unabated throughout, within which the five duets are skillfully, and seamlessly, interwoven. Sergey Antonov, the highly competent cello soloist, was pasted stage left center as the dancers responded around him. As much as I enjoyed Elo’s choreography, I was even more impressed by the overall quality of the Boston Ballet dancers: Maria Baranova, Lia Cirio, Kathleen Breen Combes, Misa Kuranaga, Addie Tapp, Paulo Arrais, Derek Dunn, Lasha Khozashvili, John Lam, and Irlan Silva. All excelled, including particularly Kuranaga’s elegant, pristine execution. But two men I’d not previously seen, and two women I’d not previously heard of, dictated my response to the piece. Khozashvili’s role involved not only execution of Elo’s steps, but also a measure of emotional depth, and he carried both off brilliantly, with a riveting intensity and quiet sincerity that are rare combined assets. He makes you “feel” what he appears to feel on stage, whether connecting with his partner or making angular arm movement meaningful. Originally from Georgia (the country), Khozashvili, who has danced with BB since 2010, drew attention to himself because he stood out. Both Dunn and Khozashvili are company principals. Baranova and Tapp are, respectively, a company soloist and second soloist. Baranova, in her initial pairing with Silva, is the ballerina next door. A Finnish expatriate who danced with John Neumeier’s Hamburg Ballet for several years before joining BB in 2015, Baranova conveys a youthful warmth and vulnerability – along with inner strength – that’s endearing (and looking a little like Alina Cojocaru doesn’t hurt). According to the BB site, she’s already assayed many major roles, including Juliet (in John Cranko’s version of Romeo and Juliet) and Nikiya in La Bayadere. Figures. Tapp looks like a stereotypical Balanchine ballerina top to bottom – not surprising since she’s a graduate of NYCB’s affiliated School of American Ballet. She too stands out – not just because she’s tall and thin and blonde with legs from here to forever (and, in this piece, relatively emotionless), but because someone as inexperienced as she is shouldn’t be able to look as supremely confident as she appears. When she’s on stage, you can’t avoid her. It remains to be seen whether acting is within her talent range, but I look forward to seeing her and all these dancers again the next time BB comes to New York. I’ve reviewed Mearns’s performance in Dances of Isadora previously (as part of Paul Taylor American Modern Dance’s “Icon” series last year), and won’t elaborate on that here. Suffice it to say that she’s marvelous in it – and a natural as a Duncan representative. It may come across as a backhanded compliment, although I don’t intend it to be, but this is one of her finest roles. And NYCB Orchestra’s Cameron Grant, who has become a star in his own right and seems to be everywhere at once, delivered the piano solos to Chopin, Brahms, and Liszt compositions as compellingly as he always does. I dislike music that’s essentially a collection of sounds made by human body organs. And when Chris Celiz stepped in front of the curtain prior to the beginning of the third piece on the program and started creating sounds with his fingers in or around his mouth that sounded like bodily functions or just plain silly (called “beatbox vocals”), I wanted to run out of the theater. But cognoscenti knew that this performance before the performance would segue into, and become the musical background for, Caleb Teicher’s dance, and as it progressed the sounds Celiz produced to accompany Caleb Teicher & Company’s Bzzz seemed less Cage-like than cagey. The last (and first) time I saw Teicher was nearly a year ago as a member of the Chase Brock Experience, which presented pieces that, with one exception, I dubbed “dances of joy.” I had heard that Teicher had his own company, and now that I’ve seen an example of the work he does for himself and his own company, it seems as if joy is Teicher’s stock and trade. 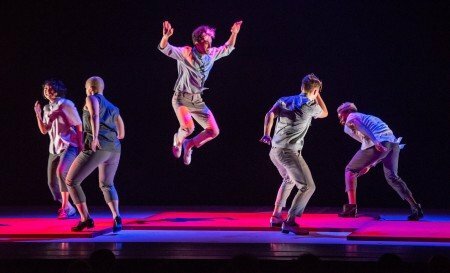 The program note indicates that Caleb Teicher & Company presents a wide-range of dance styles that include signature elements of musicality, humor and warmth; here, the dance form presented by CT&Co was tap – and tap with musicality, humor and warmth. It’s not my place to compare this company with the group led by Michelle Dorrance, the reigning queen of tap. But, based on what I’ve seen, while Dorrance takes tap into new dimensions, Bzzz elevates “traditional” tap to rare heights without altering its character or trying to make a statement. 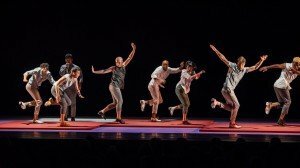 The result, for a dancing art form that’s far older in the U.S. than ballet, looks like tap not so much changed as on steroids, and ultra-contemporary. The energy level never ebbed, but it was the visual richness that I found most impressive. Koubi’s Barbarian is another dance entirely. The program note informs that the full piece is the choreographer’s “reimagining of the origins of Mediterranean culture,” in the process examining “an ancestral fear of strangers” and “the hidden refinement of ‘barbarian’ societies.” Nothing like having a limited thematic palette. Culture clash has been done, and I suppose culture absorption and transformation has as well, though off the top of my head I’m not aware of examples. But I doubt if any are like this. Since the dance performed in Program 1 is represented as being excerpts from the complete piece, I can’t comment on its overall quality. But what I saw, though somewhat confusing (perhaps because of the cutting and pasting that was done), was not only ambitious, but impressive. Koubi and his company of male Northern African male dancers are based in France. Koubi emigrated from Algeria to France – I don’t know whether the others are emigrants as well, but that’s irrelevant. The company specializes in what’s called Northern African street dance, which describes what I saw when the company appeared at FFD a few years ago. Although my affinities don’t usually include street dance, African or otherwise, what Koubi’s company presented was dancing of undeniable quality and uncommon skill. Slow forward, and Koubi’s company is even more impressive now. Although it’s still a form of street dancing, what’s presented here has a sort of tribal elegance to it, with nonstop motion and the dancers spinning like whirling dervishes. Upside down. On their hands. Often on one hand. At times it looks more like random athleticism than programmed movement, but that appearance is deceptive; there’s undeniable structure to the piece. And the simple costumes (designed by Koubi) of plain-looking but billowy “shorts / pantaloons” cleverly amplifies the sense of constant motion. After awhile the initial incessant drumbeating yields to Mozart (an unspecified composition) and the struggle takes a different turn: a mighty battle as the tribe first resists, and then absorbs, the radically unfamiliar culture. And as the dance ends, we see the natives transformed – forever altered by the globalism that had invaded it, and facing a new, different, and uncertain future visualized by one of the tribe’s members being hoisted toward the sky by the others, presumably to peer into the sunrise of the tribe’s uncertain future and identity (aka The First Dawns of the World, the dance’s subtitle). My theory: the primitive tribal civilization could fight against armor-clad warriors, but it could not shield itself from ideas that were dominating and beautiful. I have no idea whether that theory is what Koubi intended, and it doesn’t matter. What does matter is that the visual presentation is ceaselessly exciting, but also a product of intelligence, with a point to display even if I’m not certain what that point is. And the thirteen-man company danced with a level of seeming abandon – but undeniable skill – that drove the audience crazy. One day, Koubi and his company should present Barbarians – the complete piece – to New York barbarians. 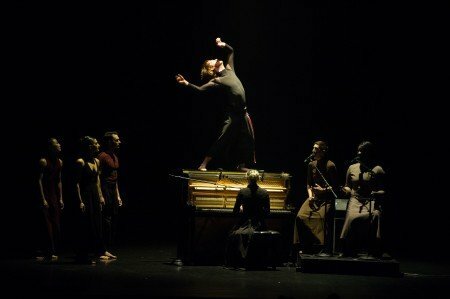 Pam Tanowitz Dance opened FFD’s second program with a “new” take on Bach’s The Goldberg Variations. Titled simply New Work for Goldberg Variations (“New Work”) – either intentionally or because the piece’s formal name hasn’t yet been determined, the dance bears no resemblance to Jerome Robbins’s masterpiece The Goldberg Variations(and seems about 1/3 its length). On the contrary, it seems to be the anti-Robbins – and maybe the anti-Bach. While a pianist plays center-stage, members of Tanowitz’s company, six women and one man, slowly emerge one by one and move to the music. Initially, the simple movement looks strange and purposeless beyond largely mirroring the music. Arms were thrust out, bodies slightly shimmied, steps were endlessly repeated. It seemed that Tanowitz was playing off the playfulness and repetitiveness in the piece and injecting comical movement for no apparent reason – but what came across was inane rather than comic. Sure Bach’s piece sounds repetitious and structured by phrase variations from which there appears to be little change from one to the other. [It’s not called The Goldberg Variations for nothing.] But Bach’s music isn’t funny and is never boring. This dance is. And where Robbins took the music to levels of significance not previously considered, Tanowitz’s piece minimizes and trivializes it. New Work did get better as the dance devolved into solo sequences with a sense of purpose even if one couldn’t discern what that purpose was, and it ended with a measure of respect for the score, but by then the damage was done. Peck’s piece, according to the program note, is an expansion of a previous piece set to music by The National. I’m not familiar with it, but regardless, Sleep Well Beast, another in a string of sneaker ballets, stands on its own as one of his best duets. Peck is well known for his ability to move groups of dancers in endlessly interesting and inventive ways, but his pairs efforts have been lackluster. Not this time – maybe because his heart was in this one. To two unidentified songs, Peck and his partner (offstage as well as on) Patricia Delgado, first explore a relationship being torn apart, and then another relationship (maybe the same one; maybe not) kept together by love – although perhaps I was not seeing it accurately, since when the dance ended the two inexplicably went their separate ways. (I suppose that breaking up is hard to do, but staying together may be harder.) As perplexing as this ending was, it doesn’t diminish the quality of the choreography or execution. One tends to forget that Peck is a fine dancer (a NYCB soloist) as well as a renowned choreographer, but his recent effort in Robbins’s West Side Story Suite (as Bernardo) rekindled memories of his powerful movement qualities. Sleep Well Beast (the title of one of The National songs? ; a reference to the persistence of doubt?) displayed his raw power as well. Delgado was his match in inner strength, but coupled with vulnerability her portrayal was irresistible. A former Principal Dancer with Miami City Ballet, it would be very nice to get to see her dance more frequently. An ABT member of the corps, Bond has been knocking on the door of choreographic success for a long time, but if there were still any lingering doubt as to her choreographic ability, with Inner Voices those doubts should now be put to rest. To unidentified Prokofiev music, Bond here creates an interwoven series of scenes within which the members of her company, all but one are current ABT dancers (and a sizeable number of company dancers not performing populated the audience) are utilized in a variety of visual forms that maintain viewer interest throughout. No one scene or dancer dominated, although I was drawn most frequently to Catherine Hurlin, Zimmi Coker, Stephanie Williams, and Erez Milatin (previously a standout with Gelsey Kirkland’s company, then New York Theatre Ballet, and to my knowledge the one in the cast not currently an ABT member). Within these opening and closing segments is embedded a complex pas de deux laden with definite, albeit non-specific, emotional gloss. Cassandra Trenary and James Whiteside were outstanding as the couple. Trenary looked more confident, and executed more cleanly, than during ABT’s Met season last spring (perhaps there had been a minor injury), and it was the most impassioned and selfless performance I’ve seen from Whiteside in a very long time. But as good as my overall impression was, Inner Voices is not without concerns. There are few images beyond the pas de deux that linger in my mind, to me indicating a diffusion of focus that might limit an audience desire to see the piece again. And the ballet’s ending is far too abrupt, creating a visual void that demands to be resolved, but isn’t. Having opened with a piece to Bach, Program 2 closed with a piece to Bach – but the two compositions and choreographic presentations could not have been more different. 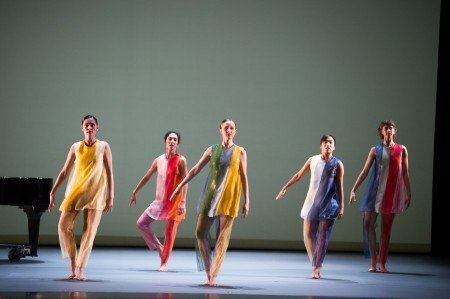 In its first appearance since its visionary founder’s death a few weeks ago, the Paul Taylor Dance Company looks as finely tuned as it ever did. And Promethean Fire, Taylor’s unacknowledged but undeniable reflection on the events of 9/11 and the triumph of the human spirit, is a masterpiece that, like his Esplanade (but totally different in every conceivable way except choreographic competence and execution), will remain a monumental work of art for generations to come. More on Program 3, and on other programs of Fall for Dance 2018 that I’m able to see, in a subsequent review.